Yes, that's right - I'm reviewing another C300, this time a 2017 model. But is it any better (or even any different) from the 2016 I drove last year? Once again I found myself behind the wheel of a (loaner) Mercedes-Benz C300 sedan (4MATIC AWD, of course, as almost every Mercedes is in the northeast) – this time from the 2017 model year. So how does it compare to the last one I drove? Surprisingly, it is actually quite a bit different – and mostly in a good way! The engine is basically the same – a turbocharged 2.0 liter inline-4, producing roughly the same horsepower as before (around 241HP, 273 lb-ft of torque). No surprises there – it’s plenty of power for a car of this size and weight, and though it sometimes reminds you that it is a very small engine, the power is perfectly serviceable, even before the turbo kicks in. However, once that turbo kicks in, watch out – with just a single turbo (no fancy variable vanes or dual-turbos here) the power comes on in one big gulp (especially in any of the “sport” modes). Maybe I’m just not used to it, but it’s almost too much power at once. Still, this is more or less unchanged from the previous model year. What has changed, however, is the transmission – whereas last time I noted how lurch-y the transmission seemed, this time Mercedes seems to have worked out all the kinks. Shifts were smooth and quick, and I never found myself worrying that maybe something was broken (as I did last time) – even in the aggressive “sport+” mode. On the interior, things were not so rosy, however. It may be down to the package that the particular car I was driving had, however a lot of the dash and console felt… rather cheap. The wood grain which flows all along the center console (and doors) was, according to the window sticker, real, but I almost didn’t believe it – it felt incredibly light and plastic-y to the touch. Gone is the weird touch pad thing that used to hover over the control knob for the car’s screen (though I think the top of the knob might be touch-sensitive; I didn’t check) but otherwise the UI stays pretty much the same. The speed of the interface does seem somewhat improved from last time, however, which is nice. 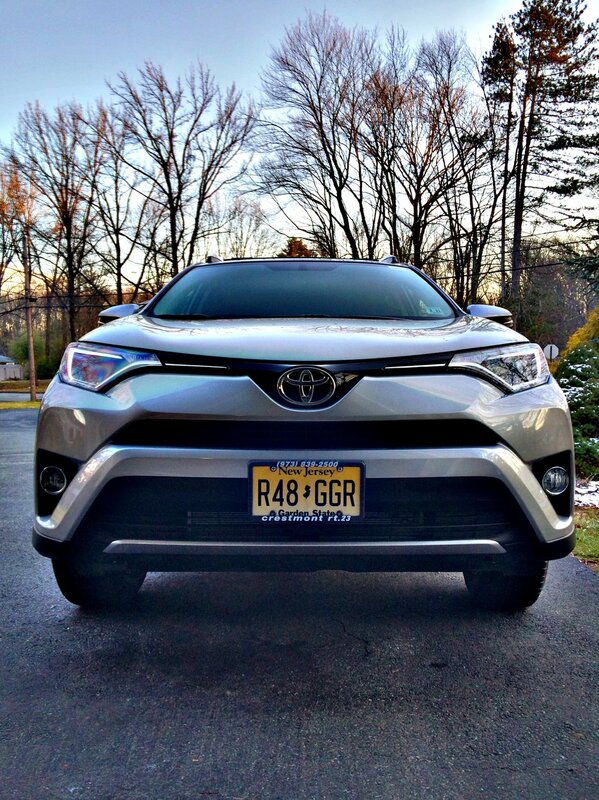 Beyond that, most everything else about the car was more or less the same – it’s a comfortable ride with nice features, a huge sunroof, but not a lot of room for back-seat passengers. All-in-all I have to say that the Mercedes C-class doesn’t exactly stand out in my mind against cars from other manufacturers – sure, some of the materials are probably higher quality, but some materials aren’t (or don’t seem to be) and other manufacturer’s are really upping their game quality-wise to nip at the heels of Mercedes’ entry-level sedan. 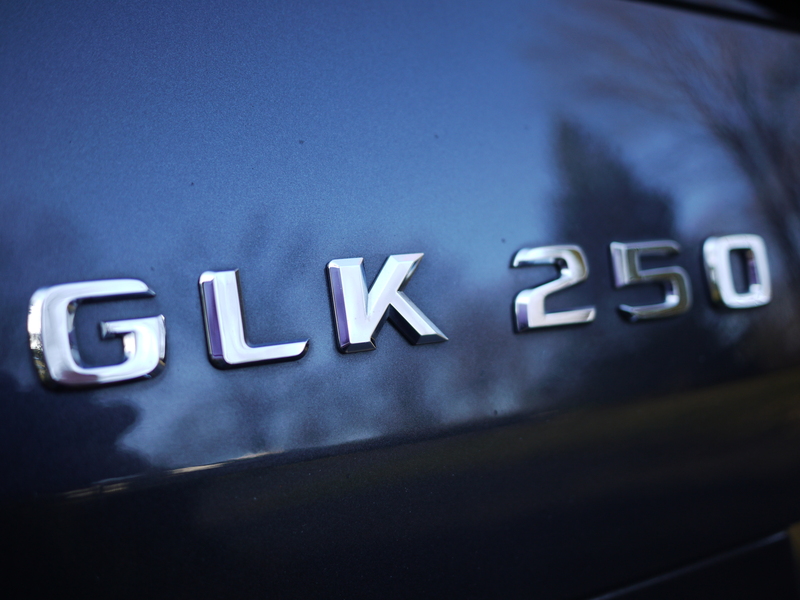 A look at Mercedes' former entry level sedan, and a lesson in "all Mercedes are not the same." 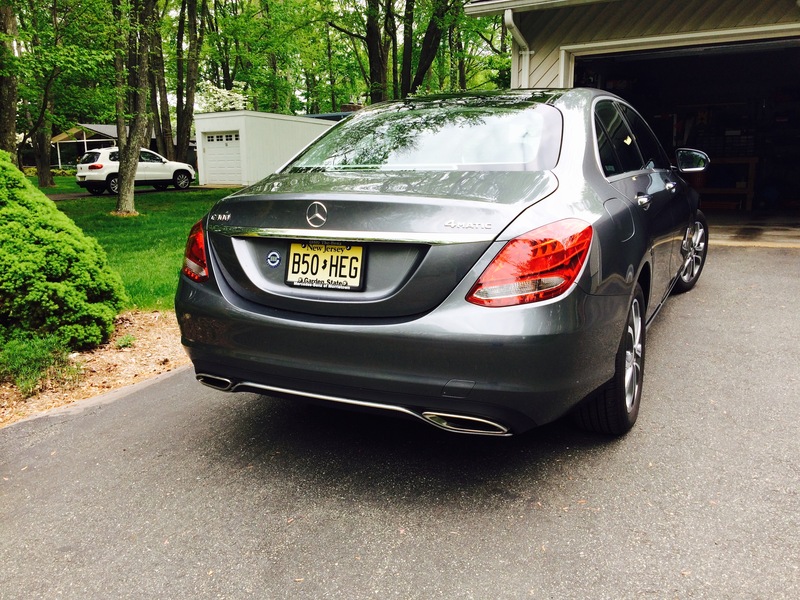 Recently my car was in the shop again (more electrical problems with the various exhaust sensors) so I had a chance to spend a bit of time with a loaner car – in this case, a brand-new 2016 Mercedes-Benz C300 4MATIC sedan. First off, the C300 is a fairly handsome looking car – I do like the way this car looks, which I can’t say for very many cars these days. Needless to say the interior is very nice and very comfortable – at least for the front passengers. Rear passengers don’t get a lot of leg room if you have your front seats pushed back a bit. The center seat in the rear is also mainly for show – there’s no way anyone over the age of 8 could sit there comfortably. With all the possible power adjustments you can make to the seats, there’s no way you won’t find a comfortable driving position – though at first my preferred position had my head touching the roof! As someone who normally drives an SUV, adjusting to a lower seating position took some getting used to. I also don’t like the tendency of cars to force you into a “lean back” position – I prefer to sit upright. However, after some fiddling I was able to find a comfortable position that didn’t have my head brushing the roof. And speaking of that roof, there is a pretty darn big sunroof in this thing – a dual sunroof, in fact. The front section is enormous, while the back section is fairly small, but still it is a lot of glass. However, the sunroof does not open all the way – it goes back about 80% of the way. Presumably there just isn’t enough roof space for it to open all the way. Still very nice, however. The media controls in this car take some getting used to, and I’m not sure how I feel about this touch pad thing that’s becoming common in these types of cars. I kind of prefer just having the wheel, to be honest. 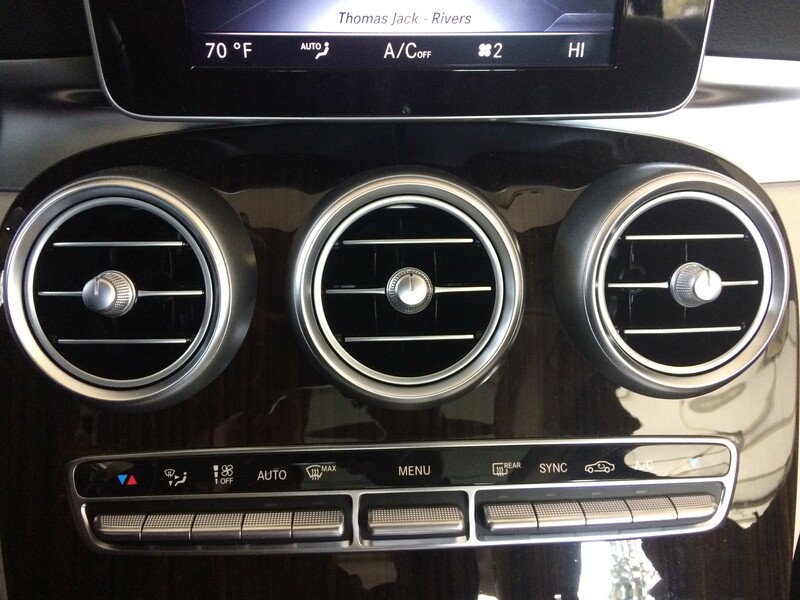 And speaking of interfaces – the interface on this car seems awfully sluggish, especially compared to my 2014 GLK. Menu movements just seem slightly delayed, like a computer with an under-powered graphics card. As for the climate controls, everything is very nicely done – I love the vents on this thing, but I do have a soft spot for round vents. There’s no dials for temperature or anything else climate related, just rocker switches – and you have to look at the middle screen to see what you’re changing it to. Now, as for the engine – this particular model has the 2.0 liter turbocharged inline 4 cylinder putting out 241 HP and 273 lb-ft of torque, and I have absolutely no complaints with those numbers. It isn’t neck-snapping fast, but once that turbo kicks in you will notice exactly how plush the seats are as you’re shoved back into them. This car isn’t terribly heavy either, so all that power gets you up and moving very quickly – and it also has 4MATIC all-wheel-drive, so it has no problem putting that power down to the ground. There is more than a bit of hesitation right off the line, though – that 2.0L I-4 really doesn’t have a lot of grunt on its own without the turbo, and the somewhat mushy accelerator doesn’t help (though switching to one of the “Sport” modes does vastly improve things). Before the turbo spools up you are reminded that there is a very small engine under the hood. However one thing I did notice was how differently the transmission on this car is programmed compared to mine – it’s the same 7-speed automatic, but it jumps gears much more quickly (2nd gear in particular might as well not exist). This seems to be done in order to keep the engine in its power band and keep the turbo spooled up – but it can occasionally get a bit annoying as the car lurches a bit as it jumps gears, and sometimes the shifts just didn’t feel as smooth as on my car. I also have to comment on the auto start/stop feature that’s becoming common on cars these days. Although the car starts up again very quickly, it does shake the whole car enough to be noticeable, and it gets annoying after a while. Additionally, when you’re making small movements forward (as you might when in mostly-stopped traffic, or when pulling those last few inches forward into a parking spot or garage) the engine starts & stops so much that it gets downright infuriating. Thankfully of course you can turn this feature off at any time – but it always comes back on the next time you start the car. And speaking of starting the car, I’m still not exactly sold on the idea of push-button start on cars. Maybe I’m just old-fashioned, but I prefer to use a key – there’s no ambiguity as to whether the car is “on” or not when using a key. Handling is excellent, but not exactly “sporty” – you can dive into corners with confidence, but this car isn’t quite “toss-able” the way lighter, sportier cars are… but then again it isn’t really meant to be. That’s not to say it isn’t fun to toss around – because it is – but it’s not something you’d spend all day doing. It’s fun for a bit, but eventually you get the feeling that this car just wants to go back to being “comfortable” – which is, unsurprisingly, where it excels. All of these modes adjust 5 different things: throttle response, steering tightness, shift points, enabling or disabling the auto start/stop feature, and climate control restrictions. The economy mode is what you’d expect – the engine turns off whenever you stop, throttle response is very muted, and the transmission tries to keep it in as high a gear as possible all the time. 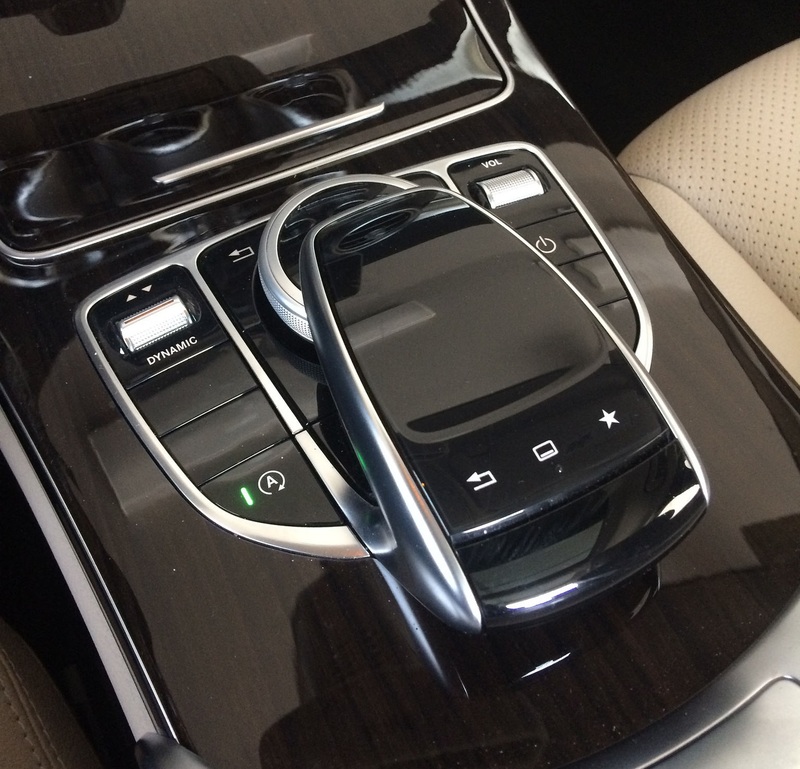 It also dials back the climate control (mainly air conditioning) to help save a little bit more fuel. Comfort mode should really be called “normal” because that’s what it is – throttle response is light (bordering on mushy), steering is average, shifting is fairly normal, the auto start/stop is enabled (but isn’t quite as aggressive as in economy mode) and all climate controls are left alone. Sport mode is also what you’d expect – the throttle response becomes nice and crisp, the steering tightens up a bit, and the transmission stays in lower gears longer. However, the auto start/stop is still enabled, and climate controls remain unchanged. All in all though the 2016 Mercedes-Benz C300 is a thoroughly nice car, if a little misguided in the Sport+ mode. It’s not a car I’d buy (the transmission and auto start/stop would drive me nuts before too long), but if you’re looking for a luxurious (but relatively small) 4-door sedan that can also be a lot of fun, you could certainly do much worse than the C300. Recently, the repair costs on my faithful old 2003 Mitsubishi Outlander started to exceed the value of the car – so it was time to start looking for a replacement. One of the cars I looked at rather extensively was a 2015 Subaru Outback 2.5i Limited. I wanted something similar to my old car – at least in the same general size & style; not too big or tall – but maybe also a bit nicer. Since Mitsubishi doesn’t make anything like that anymore, Subaru’s offering seemed like the natural choice. The Subaru Outback has a lot going for it – right off the bat I can say this is a very nice car. It looks quite nice from the outside – not too garish, as many cars are these days – and the inside is equally nice. Subaru has really improved their interior design, even compared to just a year or two ago. 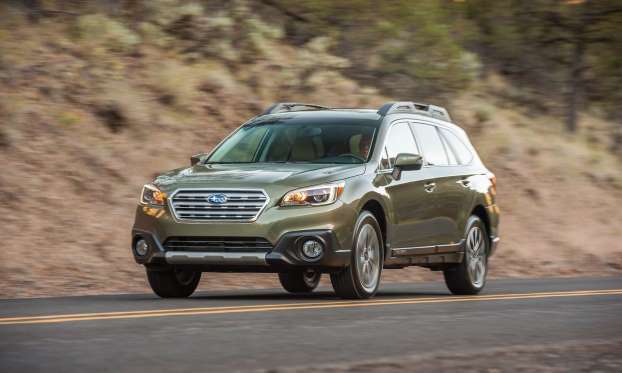 The Outback has plenty of power for a car of its size: 175 HP and 174 lb-ft of torque from it’s 2.5 liter 4-cylinder (horizontally opposed of course – that famous Subaru “boxer” configuration). It’s no race car or anything, but it gets up and moving more than quickly enough. The Outback also has incredible visibility – especially compared to many SUVs – even the side mirrors were moved down onto the door so you could have just that last little bit under the A-pillar for better forward/side visibility. Rear visibility is fantastic too – no massive blind spots on this thing. The Outback is a big car on the inside, but it doesn’t look big on the outside – it’s like the TARDIS of cars. It’s a surprisingly nimble for a car its size, with a very tight turning radius making it very good as a city car. It’s also very planted on the road (thanks to its low center of gravity), handling tight corners with ease. The roof rails also have the cross beams built into them (they fold away when not in use) which is a very clever feature – most other vehicles of this type just have the rails and the cross beams are an extra cost. All that said, there are some downsides to the Outback. It’s got lots of room, because it’s a LONG car – a full 11 inches longer than my old car – which wasn’t exactly short, either. I had to actually measure my garage to see if this would fit in it – and it turns out it would, but only just, with no room to walk in front of or behind. You also feel that size when you’re driving – especially when changing lanes. Overall, the Subaru Outback is a very nice car, especially for the price. In my mind it competes with much more upscale luxury SUVs in terms of interior. But, the size is a problem – if you’re looking for something “compact” then this is not it. But if the size doesn’t bother you, then the you could do much worse than the latest Subaru Outback.